In an earlier article, we advised you that the National Marine Fisheries Service had published a proposed rule to designate marine critical habitat for the loggerhead sea turtle. The NMFS proposal was based on scientific data analyses and economic impact analyses that contained significant shortcomings which must be addressed before the final rule is established. We believe the designation of any CH must be based on the proper application of regulations established by the Endangered Species Act (ESA). Most importantly, NMFS must base its recommendation for each CH on the best available science (including a thorough analysis of the best available historical data) and on an accurate assessment of the CH’s importance to the survival of the species. It must also give proper consideration to economic and social impacts due to any CH designation it makes. The full OBPA response submitted to the NMFS can be read here. A hearing has been scheduled in Manteo on November 21, 2013 related to the Proposed Designation of Marine Critical Habitat for the Loggerhead Sea Turtle. The hearing will be conducted by the National Marine Fisheries Service (NMFS), an agency within the National Oceanic and Atmospheric Administration (NOAA), Department of Commerce. The OBPA will publish a summary of our views on the issues that affect our membership and which must be appropriately addressed by NOAA during this process. We will publish our recommendations prior to the meeting for our members to consider in their official comments. We encourage all to comment of this important matter, and to attend the meeting in Manteo on November 21, 2013 if you are able. Comments are due by 11/29/2013. The announcement published 11/4/2013 in the Federal Register follows. SUMMARY: We, NMFS, will hold a public hearing related to our Proposed Designation of Marine Critical Habitat for the Loggerhead Sea Turtle, Caretta caretta, under the Endangered Species Act (ESA). DATES: The public hearing will be held on November 21, 2013, from 7 p.m. to 9 p.m., with doors opening at 6:30 p.m. ADDRESSES: The hearing will be held at: Dare County Administration Building, Dare County Board of Commissioners Meeting Room, 954 Marshall C. Collins Drive, Manteo, NC 27954. Doors will open for registration at 6:30 p.m. for sign-up and seating. Time allotted will depend upon the number of speakers but will likely be limited to 5 minutes each. Registered speakers will be asked to indicate their full name, contact information, and the identity of any organizations on whose behalf they may be speaking. The meeting is physically accessible to people with disabilities. Requests for auxiliary aids should be directed to Susan Pultz (see ADDRESSES) 3 days prior to the meeting. The Outer Banks Preservation Association will hold its annual members meeting on Saturday October 26, 2013 at the Cape Hatteras Anglers Club, 47231 Light Plant Road Buxton N.C. 27920 at 1:00 pm. The annual meeting will consist of a report from the president for the prior year and up-to-date informational reports to the membership by the Officers and committees. No business will be conducted at this meeting. Minutes of the meeting will be posted at www.obpa.org. After the meeting, the Board of Directors will answer any questions members might have. Hope to see you there. 2/26/2013 - House Bill H.R. 819, Preserving Access to Cape Hatteras National Seashore Recreational Area Act, was introduced by Congressman Walter B. Jones. 3/14/2013 - The House Subcommittee on Public Lands and Environmental Regulation held a Legislative hearing on H.R. 819. Congressman Walter B. Jones and Dare County Commissioners Chairman Warren Judge provided testimony at this hearing in Washington, D.C.
5/15/2013 – H.R. 819 approved 24 – 17 by House Natural Resources Committee. 7/9/2013 – H.R. 819 reported by the Committee and placed on the Union Calendar item 106. 3/7/2013 - Senate Bill S.486, Preserving Public Access to Cape Hatteras Beaches Act, was introduced by Senators Burr and cosponsored by Senator Hagan. 4/23/2013 - The Senate Subcommittee on National Parks held a hearing on S.486. 6/17/2013 – Senator Burr introduced an amendment to S. 486 cosponsored by Senator Hagan. The Senate Committee on Energy and Natural Resources unanimously approved an amendment to S. 486 in the nature of a substitute. 9/10/2013 – Senator Wyden, Chairman of the Committee on Energy and Natural Resources, reported S. 486 with amendment in the nature of a substitute to the Senate. 9/10/2013 – S.486 placed on the Senate Legislative Calendar item number 180. Floor debate and vote have not yet been scheduled. Contact your Senators and urge them to support S.486 and take the steps necessary to bring to the floor and pass this legislation. CHAPA vs Salazar(DOI), Jarvis(NPS), Murray(CAHA) case 1:12-cd-00219 which was filed in U.S. District Court for the District of Columbia on February 9, 2012. Remains active in 2013. 12/23/2012 – Judge Emmet G. Sullivan issued an order to transfer the case to the U.S. District Court for Eastern District NC where it was subsequently assigned to Judge Terrence W. Boyle. The new case number is 2:13-cv-1-BO. 2/25/2013 – Court issued Scheduling Order for motions to be filed by the parties in the case. 4/18/2013 – Court granted plaintiff’s (CHAPA) motion for extension of time to file motion for summary judgment from 4/19/2013 to 7/10/2013 with similar extensions for other scheduled dates. 9/10/2013 – Court granted defendants’ (DOI) motion for extension of time to file motion for summary judgment from 9/10/2013 to 10/8/2013. Plaintiff’s (CHAPA) response will be due 12/12/2013 and defendants’ replies will be due 1/13/2014. 7/31/2013 - CHAPA submitted a response to the NPS request for comment to the Cape Hatteras National Seashore Proposal to Facilitate Additional Public Beach Access – Environmental Assessment. 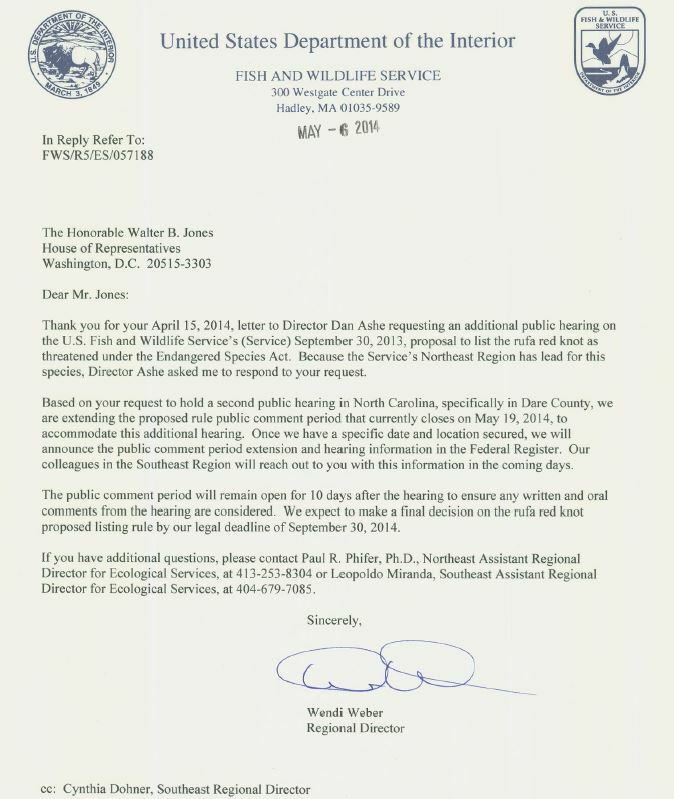 9/14/2013 – OBPA submitted comments to the US Fish and Wildlife Service on the proposed rule to designate terrestrial critical habitat for the Loggerhead sea turtle. The OBPA regularly communicates with local and federal officials to concerning issues that may affect access within CHNSRA to ensure the viewpoints of our membership are understood.